The website for the “Next Generation” of the Naruto universe reveals that there will be a spin-off from the Naruto manga, known to us as Boruto. It’s known that the manga chapter will debut and release into Shueisha’s Weekly Shonen Jump magazine on the 9th of May, and new chapter will be released in a monthly fashion starting in this years 23rd Issue. 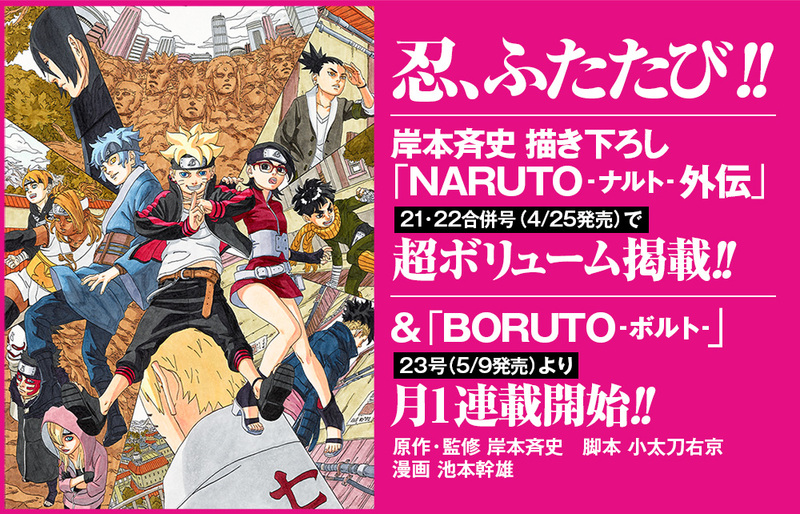 On top of this, Masashi Kishimoto will also publish a one-shot for his original Naruto manga in this year’s combined 22nd and 23rd issues on the 25th of April. Mikie Ikemoto, who worked as an assistant under Kishimoto will be drawing Boruto, all while Kishimoto supervises the manga. The manga script focuses on Boruto and thus will be written by Ukyo Kodachi, who has done previous work within Naruto. The countdown for this began last year when we saw a silhouette of the next generation of children, and thus more great news comes out of it with this post. This post and silhouette image can be found here. So what do you think? I bet many fans of the original can’t wait to see what the world of Naruto has in for us all. We saw bit here and there, but the manga will expand on that greatly. That is why I’d like to see what this manga has in for us, I will try to monthly posts for whenever it’s released. Be sure to comment down below telling me what you think of this post. I’m pretty hyped about this. I thought the last Naruto movie with Boruto was one of if not the best movies they have made. Really looking forward to reading about the future of the Leaf village and how the past reflects on the new school. Yeah, I still need to watch that one. And the Naruto/Hinata one too. Monthly chapters would be a little slow but for me it’s fine I think. I honestly don’t really care for boruto. He just doesn’t really compare to naruto in many categories such as: prank pulling, clumsiness, and overall humor. But I guess this time, he will have a father, and he will be able to learn from him. Also Sasuke will be able to somehow help him out if he needs any help, like in the movies.